Thai Naval vessel HTMS Similan recently intercepted a suspicious skiff in the Gulf of Aden. HTMS Similan is part of Combined Task Force 151, Combined Maritime Forces’ multi-national counter-piracy operation. Two Thai naval ships, the offshore patrol vessel, HTMS Pattani, and support ship, HTMS Similan, have recently disrupted pirate activities in the Gulf of Aden, adding to maritime security and the protection of legitimate merchant vessels within the region. The Royal Thai Navy counter-piracy task group is part of the multi-national Combined Task Force 151 (CTF-151). At 7 A.M. on Oct. 23, 2010, the MV Merlin Arrow issued a distress call stating that it was being attacked by a fast skiff. Indian warship INS Rajput, which was protecting a convoy in the area, sent its helicopter to investigate the skiff, which quickly changed course and headed away. Similan spotted one skiff approximately 2 miles away. Six people were seen on board with a long ladder, and the skiff was suspected as being the same that had previously attacked MV Merlin Arrow. HTMS Pattani was ordered to continue escorting the convoy, whilst HTMS Similan sent her helicopter, Stingray 1, to pursue the suspicious skiff. A ladder and unidentified objects were seen being dropped into water as the skiff was attempted to escape. Stingray 1 used smoke floats to warn the skiff to stop. HTMS Similan’s boarding teams were dispatched to investigate and found six people on board with sufficient stores to sustain them at sea for several days, as well as GPS navigation equipment. The boarding team took photographs and personal details of the skiff’s crew. 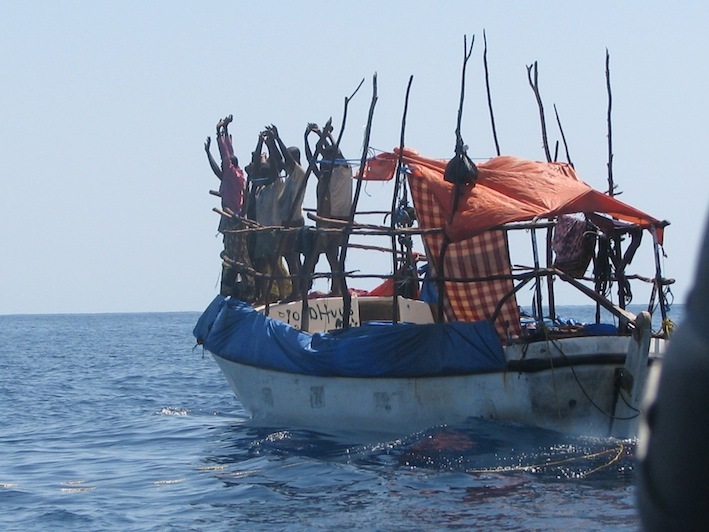 The skiff’s GPS navigation system was seized for further investigation and the suspected pirates were returned to Somalia. Later the same day, HMTS Similan was informed by another merchant vessel, MV Karachi, that two whalers and a skiff had been sighted nearby. No national flag or fishing gear were visible, so HTMS Similan again went to investigate and signalled the whalers to stop. HTMS Similan reported seeing objects were seen being thrown into water from the whalers. After the whalers had stopped, HTMS Similan sent out its boarding teams. In total, there were 14 people and enough fuel, food and water to sustain themselves at sea for at least a week, as well as four grappling hooks. Once the boarding team had completed their investigation, the whalers were driven out of the Internationally Recommended Transit Corridor with enough fuel to return to shore. CTF-151 was established in January 2009 as a multi-national counter-piracy task force. In conjunction with NATO and EU Naval Force (EUNAVFOR), ships from CTF-151 patrol in the Somali Basin and the Internationally Recommended Transit Corridor (IRTC) in the Gulf of Aden. CTF-151 also supports the Best Management Practice methods which are promoted to the shipping industry for the avoidance of piracy. CTF-151 is one of three task forces operated by Combined Maritime Forces (CMF), a global maritime partnership, dedicated to promoting security and prosperity across some 2.5 million square miles (6.5 square kilometres) of international waters in the Middle East. CMF’s main focus areas are countering terrorism, preventing piracy, reducing illegal activities, and promoting a safe maritime environment.